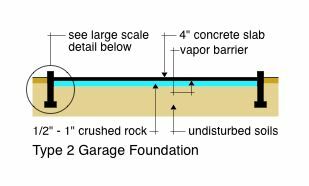 The garage foundation is the most important part of your building project from a long-term perspective. It determines the stability of what you place on top of it and has to be designed in accordance with the weather and soil conditions that exist on the property where you plan on building a garage. There are three basic types of foundation that you can consider for your project when planning on building a garage. We will call them Type 1, Type 2 and Type 3. Type 1 is sometimes referred to as a thickened slab garage foundation and Type 2 is often referred to as a stem wall garage foundation and Type 3 is often referred to as a hybrid stem wall garage foundation for the reason that it is a combination of both Type 1 and Type 2 and is often used in areas that have highly plastic soils conditions such as is found in South Dakota and other parts of the U.S.A. and Canada. There is a world of difference between the three types, and which one will be appropriate for your project may depend upon what the local building official will allow in the jurisdiction you plan on building a garage in. Lets examine the differences in the three types. The Type 1 Foundation shown at the left is usually suitable for a one-story garage design that your building official can be certain will never be used for human habitation. It is an inexpensive approach to a combination floor-footing system that can even be used in deep-frost country if the soils drain well so as to prevent frost heave damage to any part of the garage foundation and superstructure sitting on top of it. If you live in rocky soils country such as Arkansas, Oklahoma or Texas where they often have to remove portions of the rock by way of explosives or jack-hammering, this type of foundation may be the standard for building a garage since frost-depth is not a concern. 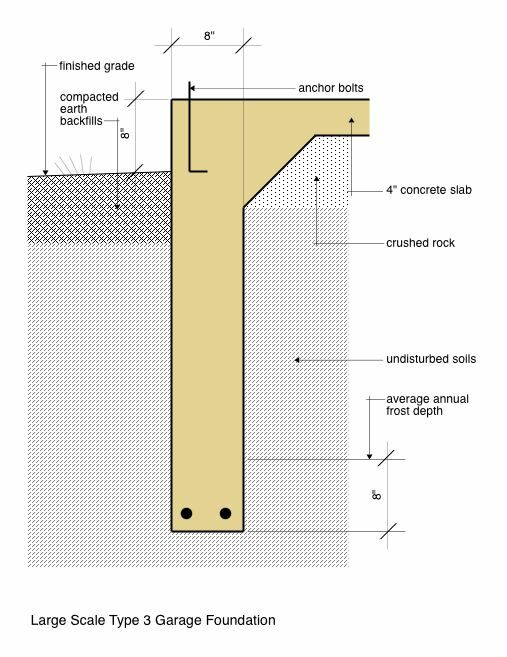 The large scale detail below shows a cross section through the perimeter of the Type 1 Garage Foundation giving dimensional details and the general placement of reinforcing steel and anchor bolts. You will also need some type of steel reinforcing in the garage floor slab portion of the design such as 10 gauge wire mesh that is formed in 6" x 6" squares. It comes in rolls about four-feet wide and can be laid on top of the crushed rock and pulled-up, as you pour the slab, with a hooking-pole to about 1-1/2" below the finished floor surface. The Type 1 Foundation system only requires a perimeter form and you pour the entire floor-footing system all in the same pour. Make sure you place a vapor barrier directly below the floor slab before you place your wire-mesh and tape the joints at the overlaps. That way you can prevent any moisture from appearing on the floor slab surface in the event you want to place a epoxy garage floor finish on the surface. Your vapor barrier should be 6 mil. polyethylene which can be purchased at any Big Box Home Store. Overlap the seams about 12" and use a tape product recommended to resist water-vapor penetration, at the overlaps. Depending upon your local building official requirements, you may need to consult with a Professional Structural Engineer for the design of this type (or any type) of structural foundation and have him/her provide the foundation plans. This is generally not necessary, but it depends on what you are required to do in the local jurisdiction in order to obtain a building permit for building a garage. The rules vary greatly, so talk with your building official first before you obtain your garage plans package. The Type 2 Foundation shown at the left is what you will be required to use if you can't use the previously discussed foundation type, or are building a garage of more than one-story (with possible dwelling space above) requiring a spread footing to distribute the loads. This type of foundation rests upon a reinforced concrete spread footing and then has a concrete stem wall formed on top of it. The floor slab is poured independently of the foundation walls and is separated by an expansion joint at the entire perimeter of the floor where it adjoins any wall surface. The depth of the spread footing is determined by your local jurisdiction based upon the average annual frost depth for your geographic location. The top of the spread footing usually sits at the average frost depth giving you a little extra insurance against frost-heave damage. 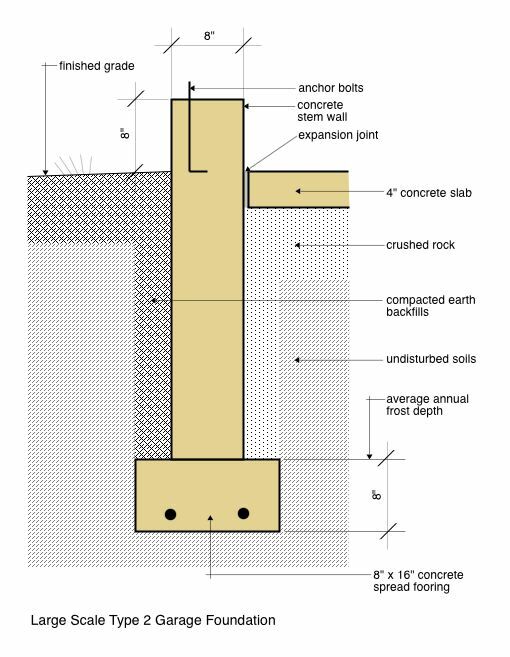 The large scale detail below shows a cross section through the perimeter of the Type 2 Garage Foundation giving dimensional details and the general placement of reinforcing steel and anchor bolts. You will also need some type of steel reinforcing in the garage floor slab portion similar to what is described above in the Type 1 Garage Foundation. The Type 3 Foundation shown at the left can be used in areas that have poorly drained soils or highly expansive soils where frost heave or expansive soil heave is a concern. If you plan on building a garage of more than one-story on this type of foundation, then the determining factor will be the bearing capacity of the soils. This factor will mainly apply to the category of poorly drained soils, as expansive soils generally require a narrowing of the bearing area of the footing in order to distribute the load over the least amount of expansive soils reaction (upward soils pressure). The depth of the stem wall is determined by your local jurisdiction based upon the average annual frost depth for your geographic location. The bottom of the stem wall usually sits at 8" below the average frost depth giving you a little extra insurance against frost-heave damage. The large scale detail below shows a cross section through the perimeter of the Type 3 Garage Foundation giving dimensional details and the general placement of reinforcing steel and anchor bolts. You will also need some type of steel reinforcing in the garage floor slab portion similar to what is described above in the Type 1 Garage Foundation. 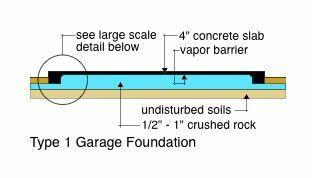 Another consideration for all of the above described foundation types is the slope of the floor towards the overhead door so that the garage floor will drain for cleaning purposes. This is much more critical in the Type 1 and Type 3 Garage Foundation since the floor is an integral part of the perimeter footing so it requires some advanced thought and planning before you begin your concrete pour. 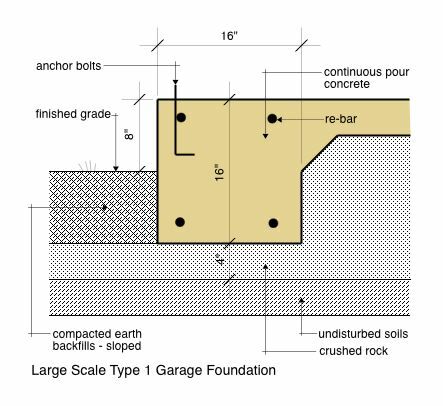 The Type 1, Type 2 and Type 3 foundations shown on this page are appropriate for building a prefab garage, wood kit garage, steel garage, or stick built garage. The loads will be the same no matter which garage superstructure system you use. When learning how to build a garage it helps if you have a detailed set of plans to study for educational purposes to learn what is involved in the overall process. GarageTips-101 offers at a nominal price a set of single car garage plans (12' x 24') consisting of 6 sheets of drawings on 11" x 17" sheet sizes with details that show how the floor slope in the Type 1 Garage Foundation is accomplished. They are available in PDF format and can be used for own project of building a garage. Go to our Contact Us page and fill in the form stating your interest in the Garage Plans, and we will get back to you via email with the delivery options, payment options, and total cost. After you decide what type of garage foundation will be appropriate for your project, you can learn about foundation layout by visiting that page and studying the two main techniques used by the Pro's to achieve a square layout using batter boards and a little trigonometry. If you have a question-please state it, and we or one of our readers will get you an answer. If you have a comment or would like to share your garage foundation story — please do so. Our readers will love it! If you have photos or graphics about your garage foundation story, please feel free to upload them.